Offices all around the world are infamous for their flickering, dim, and let’s face it — depressing fluorescent lighting. The fluorescent lights have actually been proven to have negative effects on workers’ mental and physical health and even their productivity. A study conducted by the American Society of Interior Designers showed that a staggering 68 percent of employees complained about their office lighting. 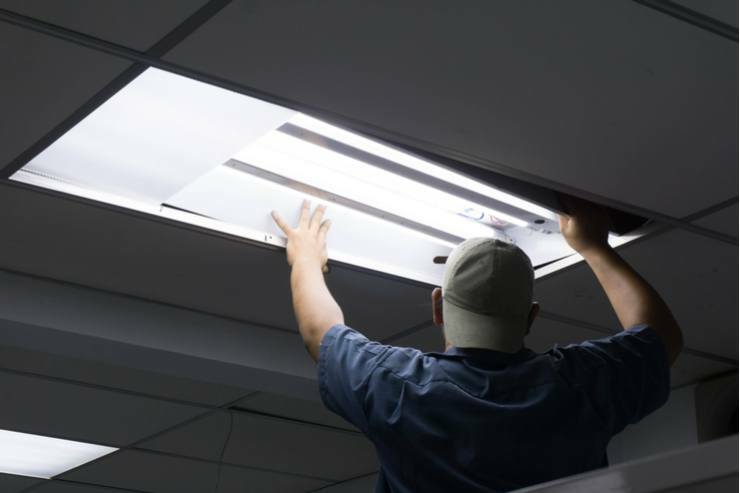 If your office is still using an out-of-date fluorescent lighting system, the first and most important change you need to make is to switch to a modern, brighter LED or CFL lighting system. Both LED and CFL lighting systems are much more energy-efficient, cost-efficient and easier on the eyes than old fluorescent systems. LED lights are made up of miniature bulbs powered by the movement of electrons. This modern technology replaces the filament inside a regular incandescent bulb and is also proven to positively impact a person’s health and make workers more productive in the process. CFL lights are a more powerful, light-bulb version of fluorescent lighting. CFL bulbs screw into standard light sockets, come in a wide range of shapes and sizes, and give off a similar lighting effect to regular incandescent bulbs. Whether you choose to go with a CFL or LED lighting system, your office workers are sure to thank you after you make the switch. Traditional office ceiling grids tend to have a bland, 1990s office look and feel with their plain white perforated soundboards. However, modern ceiling grids are more aesthetically pleasing and easier to install. They’re broken into segments with spaces that expose the ceiling, while still including sound masking and electronic equipment to provide a more modern, open office look. Within these setups, the lighting is arranged to make a huge aesthetic difference by using the mix of the modern open ceiling to help light bounce around the office more, while still maintaining crucial sound reduction and using noise-canceling speakers to cut down on noise transfer throughout the workplace. Introducing natural lighting into the office is one of the best possible ways to make your workers feel happier and healthier. A recent study on the effects of natural lighting on employees reported that over 50 percent of the respondents believed natural light and views of the outdoors to be their most important office perks, leaving behind onsite cafeterias, fitness centers, medical care, and childcare. Not only do workers want natural lighting — it’s also necessary to improve their health. One study of workplace lighting showed that workers without windows reported lower scores than their counterparts on quality of life measures related to overall sleep quality, sleep efficiency, and daytime dysfunction. Of course, it’s not always feasible to add natural lighting like skylights or new windows in every building. To combat this, offices can try to adjust the lighting in their offices to look more like sunlight, and add seasonal affective disorder lightboxes throughout the office during long winter days when there are only a few hours of daylight. Using open office furniture concepts instead of old high wall cubicles also allows more natural light to filter into your space. In offices with traditional lighting systems, employees had no choice in the color and brightness of the system. However, modern systems now allow offices to customize the lighting color they want based on their unique preferences. There are generally three choices of colors when choosing lighting: warm, with more orange tones, cold, with brighter white tones, or a medium between the two. 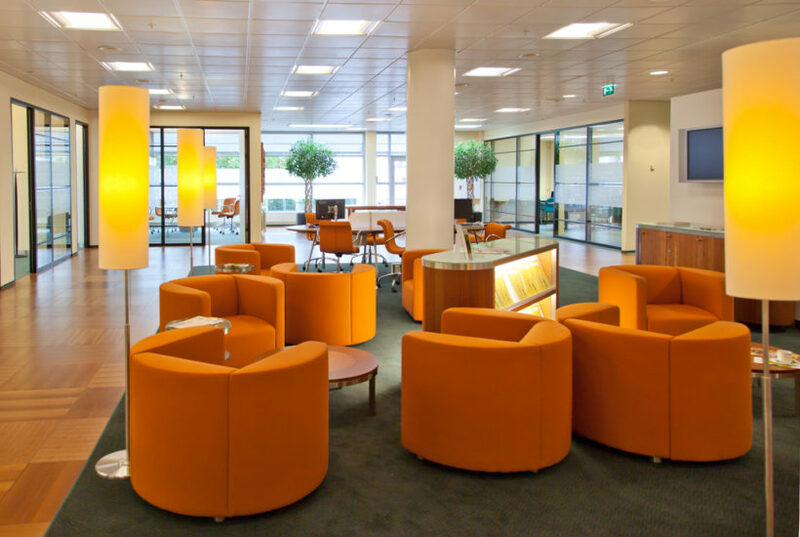 While some employees may strongly prefer warm tones over cold ones and vice versa, many offices can settle on a choice that lies somewhere in the middle, leaving all employees happy with the lighting and ready to be more productive. By implementing some or all of these lighting tricks into your office, you can ensure you’re taking concrete steps to improve the happiness and health of your employees and improve the overall work environment. As the manager of Cubicle Concepts, Andrew has more than 15 years of experience working closely with companies to modernize and transform their workspaces.